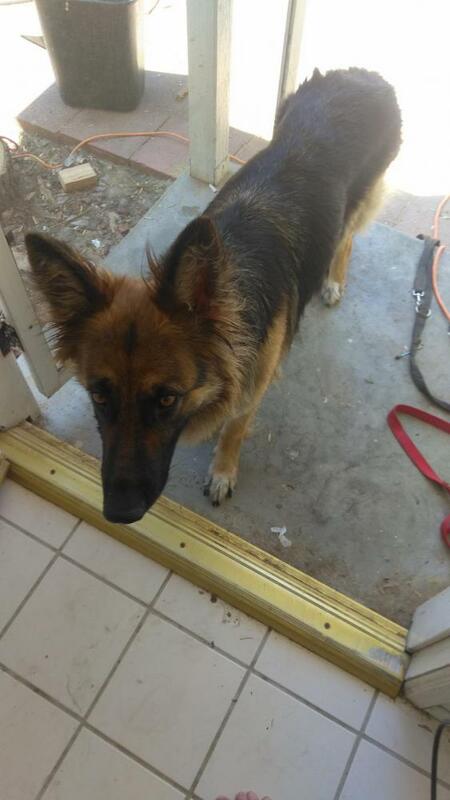 Me and my fiance were browsing rescues and shelters and found a female GSD that someone was rehoming via Craigslist. They said she was 2-3 years old and she obviously had been neglected. She was underweight, had super long nails, was dirty and had severely matted/dreaded hair behind her ears. She wasn't fixed and I planned to get it done asap. We already own a fixed male WL GSD. The new dog seemed particularly hostile with my 5 year old male and she started showing signs of what I assumed was a false pregnancy. I made a vet appointment to make sure she wasn't pregnant and make arrangements for her to be spayed. About a week ago (and a day before vet appointment) she started hanging out in the closet. I assumed it was the hormonal changes due to the false pregnancy until I heard a little squeek come out of the closet. I've always been very outspoken about spaying/neutering and have been against bybing. I'm not sure what compelled me to adopt off CL and not from a reputable rescue or shelter. so I am still adjusting to the shock that I have 7 BYB pups in a box in my closet. I have no idea what I'm doing aside from the helpful and friendly advice of staff at my vets office and how to articles online. I've never owned a dog younger than 10 months. I made a make shift whelping box and have been doing my best to make sure mom is not.stepping on or squishing pups and that she has plenty of food and fresh water. All puppies came out healthy and after five days all are feeding and growing. I was feeding my dogs a raw diet but switched mom to a high quality dry food since I'm all around more familiar with feeding that to dogs. The pups are at least half GSD. Mom is small, long haired red and black dog who looks WGSL. I know little else about her. So far she is biddable and mellow but she also has been pregnant or nursing so I don't know how different she will be after this is over. Who knows who dad is. Could be a coyote for all I know! (JK.. hopefully :0) they look like they could be all or mostly GSD but it's way too early to really guess. I don't have space, time or resources for 7 puppies, let alone that I rent and landlord told me I better find homes for these pups. I'll keep them 8-12 weeks of course, but then need to quickly find homes for them. I don't even know where to start. I never even considered the possibility of having this problem since I never planned to own intact dogs and had no desire to ever breed and contribute to overpopulation of dogs. It blows my mind people actually do this for profit- not responsible breeding but backyard breeding. I should of been more careful about where I adopted from and should of rushed her into the vet. It was really stupid of me not too. I'm really grateful she gave birth without complications and the puppies all came out healthy. I'm located in the Los Angeles area. If anyone has suggestions about how I should go about finding homes for the dogs, please let me know. I'm attaching a pic of one or two of the pups and of mom.pups are either reddish tan mixed with black and with a black stripes on back like in first and third pic or are mostly black like second picture. Well they are cute aren't they! We have some good people here that have loads of rescue knowledge. I know there are rescues that can assist with these situations. It happens more then you would think. Bless your heart. Thank you for taking in this girl. She is a beauty. I would contact rescues and enlist their help for puppy placement. It sounds like you are doing a great job so far. Weekends can be slow, on the board, but give it a little time and you will get some informative responses. Mom does look like a long haired purebred German showline. She also looks way too thin. Make sure she's getting LOTS of high-quality food while nursing those pups! A calcium supplement might be a good idea, too, as the nursing can deplete calcium. When I worked for a breeder, she always gave the nursing moms liquid calcium. It's important to have a heat lamp or special heat pad for the pups during the first week or so, as they can't regulate their body temperature, and can get chilled very easily. Make sure they can move away from the heat source if they get too hot. No good deed goes unpunished, right? Call Westside German Shepherd Rescue (Downtown LA) and Los Angeles GSR (Burbank)...and ask them both if they have any experienced puppy fosters who would help by taking mom and the pups, with the understanding you'll be taking mom back once they're weaned, and handling her vet needs, and they'll be finding homes for the pups. There are foster homes that "specialize" in this situation -- what you described is just one of those things that happens sometimes, as stray dogs get knocked up before they are recovered, and they sometimes can't be spayed right away for various reasons. Shelters that don't put Fs on the spay schedule until they have an adopter encounter this situation a few times a year (they just come in to work in the AM, and she's given birth in her kennel overnight). So there is a network of neo-natal puppy fosters out there. They're always ecstatic when mom is with the litter and "helping," as it makes the foster family's job so much easier. Letting one of the rescues handle finding homes for the pups is really important because statistically, puppies have sky-high return rates in rescue. It's much harder to find good homes than you might guess...even though everybody thinks they want a puppy. Doing home checks, reference checks, and proper placements for a whole litter is incredibly time consuming. Even doing all that, the chewing and mouthing often causes well-meaning, inexperienced people who've never raised one to bail. 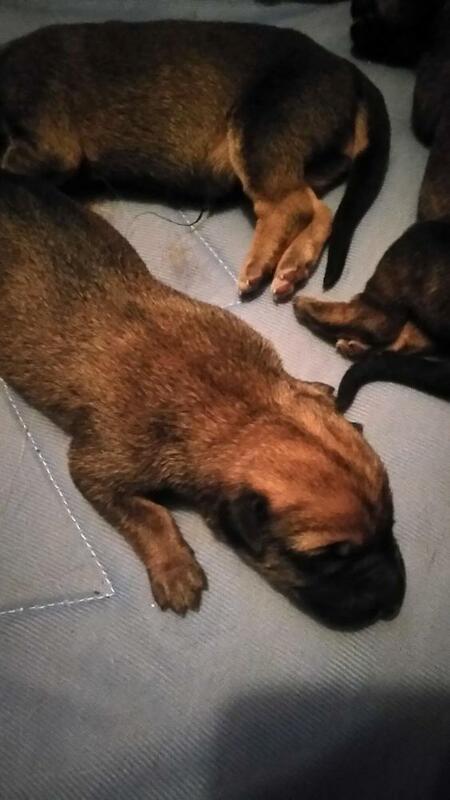 The pups will need a life-long safety net so that they never end up in a shelter. Well-established rescues can provide that -- you didn't sign up for it and shouldn't have to worry about calls a year down the road that someone's bringing a now-grown dog back. Ask the rescues for help. Last edited by Magwart; 08-20-2017 at 10:46 AM. 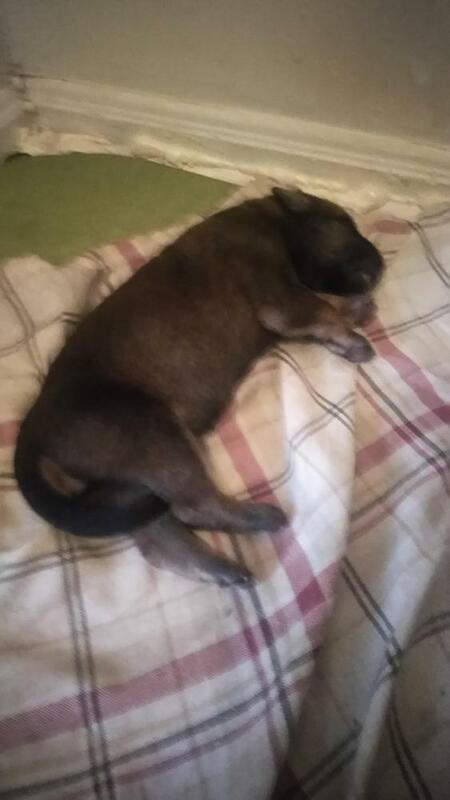 well looking at the pictures is there any possibility that the sire could be a SABLE GSD . since a lot of rescue groups are importing dogs , why not contact one to see if they can take the entire litter when they are weaned around 6 to 7 weeks . puppies are always the first to be adopted . Mom to me doesn't look purebred due to the 4 white paws - although everything else looks GSD.. Pups are adorable, and poor momma looks very thin and dull coat. I know you will do a great job bringing her up to a healthy level and giving her all the love and attention she and the pups need.. Hope you find good homes for all the wee ones and that they enrich your life while they are with you - they will be alot of work, but alot of fun too. You're in Orange County - that's Florida, right? Okay, so not too worried about pups getting chilled at this time of year, but it's something to remember if the weather gets cool. 85 degrees F is the optimal temperature for them in their first week of life. I have seen many German show lines with white on their paws. I've even seen a purebred American show dog with a white sock - his owner would dye it with tea before she showed him! So, I think it's still possible she's a purebred. OTOH, I have seen mixed breeds that COULD pass for purebred, until you noticed their white feet. 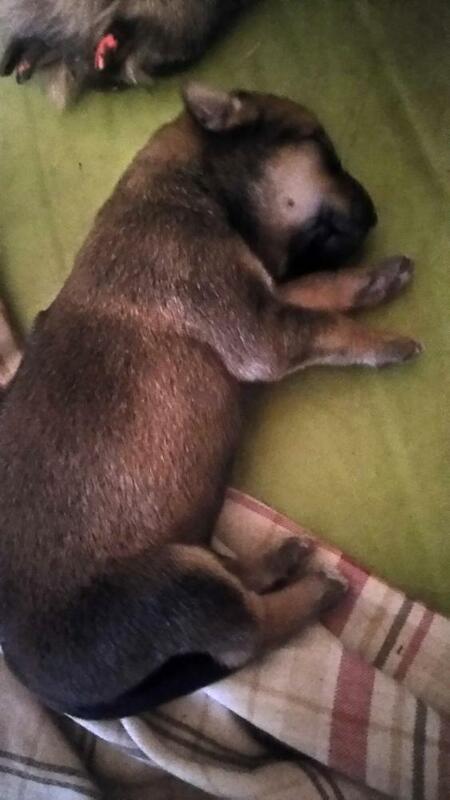 Here's my purebred GSL at 8 weeks -the white marks did fade as she got older, but she still has some white nails. It's less than ideal pigmentation, but if the areas are small enough, will not result in disqualification in the show ring. Mom looks pure, pups do not...even with the likelihood of a sable papa. But that's neither hear nor there. Additionally, which you may already know... there is a gsr of Orange County, as well as coastal gsr - I believe their territories overlap. Carm, SoCal rescues aren't in the importing crowd - that half of the state has 5 gsd specific rescues, always full, and westside alone places 1,000 dogs a year. The California GSD situation is gnarly. It's So. Cal that has an excess of GSDs and even malinois. But places like Portland and Seattle import dogs. 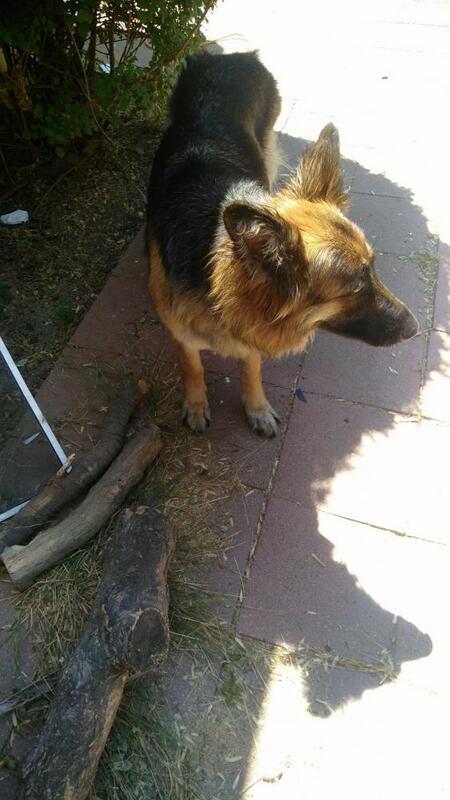 I might try to contact a GSD or other rescue "up north" and see if they can help you. My friend and I found an entire litter of dumped lab-mix puppies at a state park in Southern Illinois years ago. She contacted a rescue based out of Minnesota or Wisconsin, and they provided transport and even gave her some $ for puppy food. She kept the pups for a week or so before they were transported north and all were immediately adopted. The pups were weaned, though (probably 8 weeks or so when we found them). You can probably find a similar rescue north of you, who might be willing to help. The difficulty might be that rescues don't want to work with you because you technically "own" the pups, even though you had nothing to do with breeding them. But it's certainly worth some phone calls or emails. It's going to be tough to find good homes where you are, even though OC is super wealthy in parts, I think there is still a pet overpopulation problem. Thank you for taking care of the pups! Once they get mobile it is even more work, and clean-up!! so if you don't feel like dealing with that, a rescue might be able to provide foster care for mom and pups until they are weaned.